Found in the southeastern United States, fire ants are an aggressive insect. Fire ant stings are painful, itchy and the site of the ant bite is also prone to infection; it's very common for a pustule to form following a fire ant sting. In rare cases, the infected fire ant bite can lead to serious infection and permanent scarring. Learn how to treat a fire ant sting and prevent serious infection at the site of the bite. After about ten minutes (once the after-bite has had an opportunity to work) wash the site of the fire ant sting with antibacterial soap like Dial. Scrub the site for two full minutes before rinsing with water. Washing for the full two minutes will dramatically lessen the chance of infection. Apply betadine, an antiseptic solution. 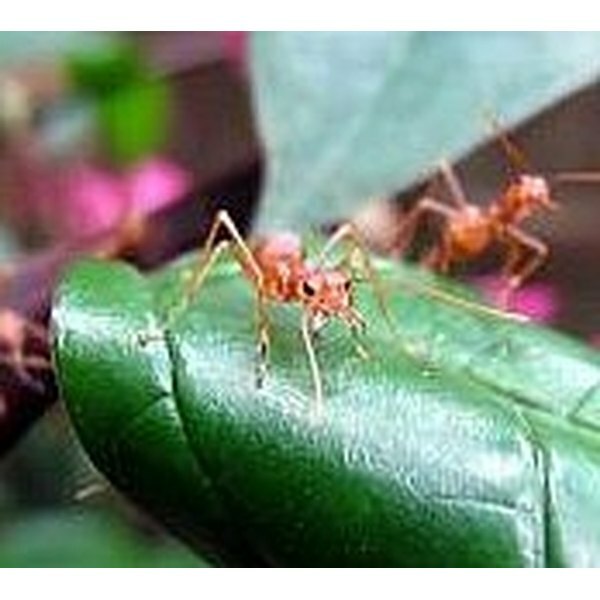 If betadine is not available, isopropyl alcohol or hydrogen peroxide will suffice, but betadine is by far the most effective in preventing and treating fire ant bites and the infection that's often associated with these insect stings. Allow the betadine to air dry. Do not blow on the betadine to hasten drying; this will only contaminate the site of the ant bite with bacteria. If the fire ant sting itches intensely, apply a thin coat of hydrocortisone cream. Apply antibiotic ointment to the fire ant bite and then cover with a Band-Aid. Repeat steps 1 through 5 three times per day until the fire ant sting has healed. It will typically take about one week for the ant bite to heal, though healing may take longer if the fire ant sting site becomes infected. Do not pick at, squeeze or attempt to "pop" the pustule that forms at the site of the fire ant sting. This will only drive the infection deeper into the skin, worsening the infection. Over time, the fire ant bite should be improving in appearance. If the swelling, redness and pain worsens, or if the site of the bite begins oozing a discharge, this indicates an infection and medical attention will be required. Some people will suffer an allergic reaction to a fire ant bite. Fire ant sting allergic reactions can lead to a potentially deadly case of anaphylactic shock. Anaphylaxis from an insect bite is associated with shortness of breath, difficulty breathing, rapid heart rate, sweating and suddenly pale skin color, call 911 and seek immediate medical attention. Diabetics must be especially cautious when suffering a sting from a fire ant. Fire ant bites are very prone to infection and since the ants often bite the feet and legs, this puts the diabetic at risk since diabetes makes a person prone to serious health effects from infections that form on the extremities.